Looking north on 10th Avenue. Hudson Yards' first phase at the eastern rail yards continues to make significant progress, with work progressing on all sites. When complete, the 28-acre site will be the largest private real estate development in the history of the United States, and the city's largest since Rockefeller Center in the 1930's. Steel superstructure continues its rise at the second office tower, 30 Hudson Yards, at the northeastern corner of the rail yards. Designed by KPF, the 92-story, 1,287-foot tower will house Time Warner Inc. and feature an open-air observation deck. Steel superstructure has surpassed the 900 foot mark, with only the final third of it's structural height left before topping out. Installation of the glass curtain wall is also well underway, having surpassed the half-way mark. Looking up at the northeast corner of 30 Hudson Yards. Looking up at the east facade of 30 Hudson Yards. Hudson Yards retail podium (foreground) and 30 Hudson Yards (background). Looking east from the High Line towards the towers of Hudson Yards: 15 Hudson Yards and The Shed (far right), 10 Hudson Yards (right), Vessel (center), 30 Hudson Yards (left), 35 Hudson Yards (left), and 55 Hudson Yards (far left). Northwest corner of 10 Hudson Yards (left) and 15 Hudson Yards with The Shed (right). Looking up at the west facade of 15 Hudson Yards. Looking up at the south facade of 15 Hudson Yards (center) and The Shed (right). Southeast corner of The Shed (foreground) and 15 Hudson Yards (background). A large open space designed by Nelson Byrd Woltz Landscape Architects will be located at the center of the development. The centerpiece of this space will be Thomas Heatherwick's Vessel, a 150 foot tall installation that features 154 flights of stairs arranged in a conical shape that flares outward as it rises. The public will be able to climb their way to the top and experience the site from different vantage points as they make the trek. South facade of 35 Hudson Yards from 11th Avenue. Close-up of the east facade of the podium at 35 Hudson Yards. 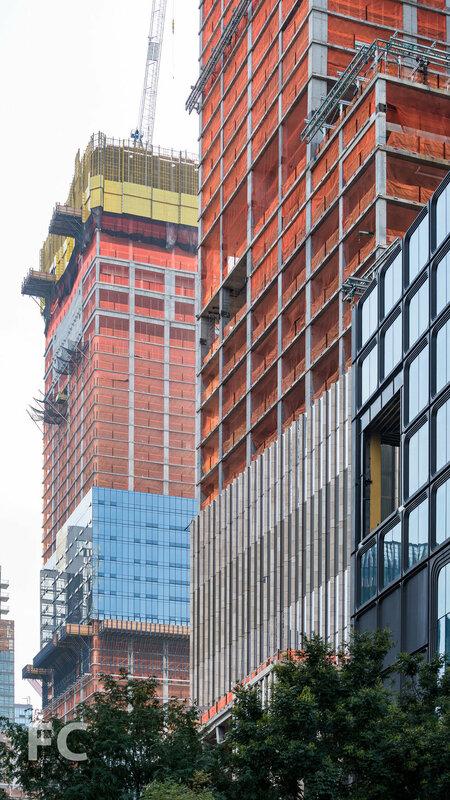 Concrete superstructure has topped out at 55 Hudson Yards, the Related Companies office tower at the corner of 11th Avenue and West 34th Street. Design of the 51-story, 780-foot tower is led by Kohn Pedersen Fox with Kevin Roche John Dinkeloo and Associates. The tower's massing features a tenth floor setback that affords an outdoor terrace with views of the larger development as well as Hudson Park and the High Line. On the exterior, the curtain wall features black metal mullion caps that create a grid of chamfered rectangles. Southwest corner of 55 Hudson Yards. Looking up at the west facade of 55 Hudson Yards. 30 Hudson Yards reflected in the facade of 55 Hudson Yards. Close-up of the facades of 15 Hudson Yards (left), 35 Hudson Yards (center), and 55 Hudson Yards (right). Looking south on 11th Avenue towards 30 Hudson Yards (left) and 55 Hudson Yards (right).